There are as many definitions of poetry as there are poets. Welsh poet and writer Dylan Thomas defined poetry this way: “Poetry is what makes me laugh or cry or yawn, what makes my toenails twinkle, what makes me want to do this or that or nothing.” Not a written poem caused wonderful emotional moments at the Arabian Horse Festival, but young and upcoming filly Poesie TI. 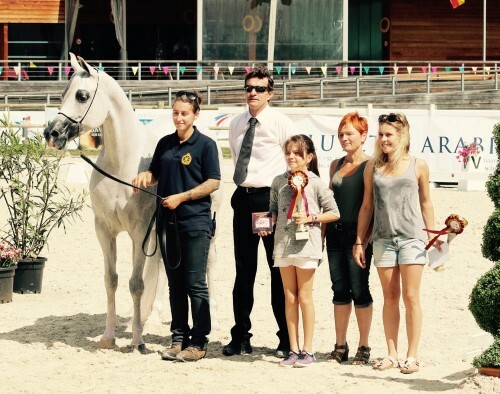 Class winner, Gold Champion Junior Filly, Best Head and Best in Show – by unanimous decision of the judges’ team, Maria Ferraroni (IT), Michaela Weidner (DE) and Christine Valette (FR). What a great success for proud breeder and owner Titanium Arabians. And a fantastic confirmation that they made the right decision by Kanz Albidayer with the Om El Bellissimo daughter Pellissima. Kanz Albidayer hardly needs any introduction as he has an enviable show record with major championships in both Europe and the Middle East. Without question the show record of his progeny will soon eclipse his show record. On the female side of Poesie TI’s pedigree the dam Pellissima offers a wise combination of magnificent stallions. Pellissima herself is by Om El Bellissimo out of an Ekstern daughter and than Eukaliptus – Probat. 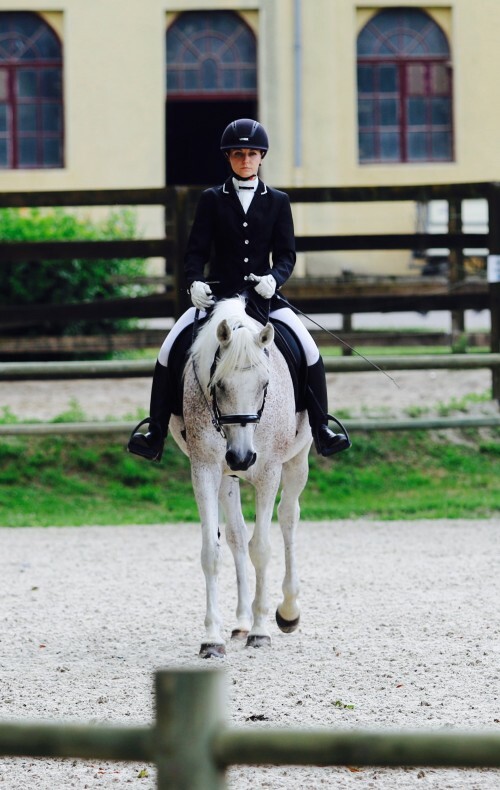 In tail female line she is tracing back to Polish National Champion Mare Pentoda, dam of US National Champion Mare Penicylina. 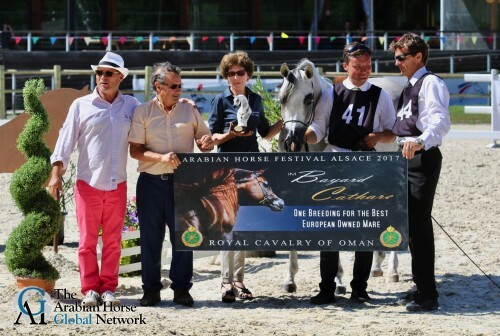 Frenchman Franck Cibois had an exceptional weekend, showing the current showstring for the Royal Cavalry of Oman. Franck and his team came with ten horses and went home with eight medals, among them two golden ones. One for the Gold Champion Senior Stallion Abbar, a WH justice son out of Lady Sorrel, the other one for Princess Marwan RC, Gold Champion Yearling Filly. Princess Marwan RC is by – can you guess – Marwan Al Shaqab and out of the hauntingly beautiful WH Justice daughter Al Princess Aliha. 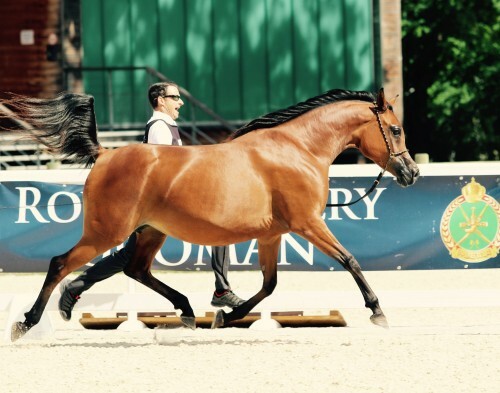 L’Imperatrice EA garnered Gold Champion Senior Mare, out of Lamira by Laman HVP and Miriam II, tracing back to the influential family of Neschi – Nevada – Mammona. Bred by Equus Arabians, L’Imperatrice EA is now owned by JJ Arabians. As the Shanghai EA daughter L’Imperatrice EA was also the Best European Mare, her proud owners won a breeding to multi champion stallion IM Bayard Cathare, one of the most famous French Arabian horse stallions and known for his powerful trot. 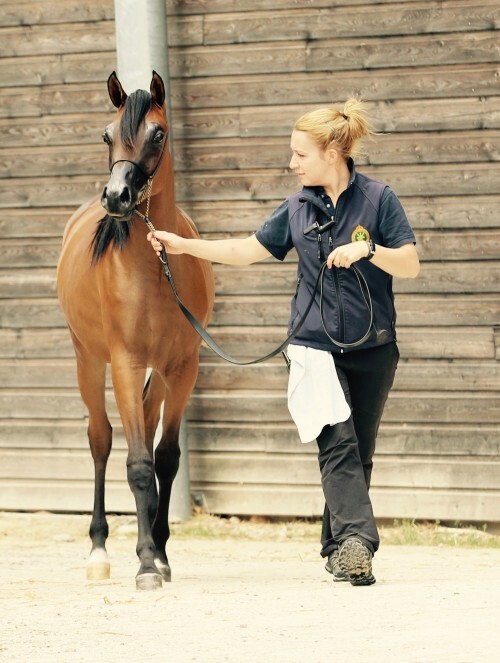 Obviously the show season in Europe just started but another trainer, who resides in France, already enjoy championship honours at several shows: Scott Allman. “For us it went excellent here, as a matter of fact,” Scott reports. “All of our horses qualified for the championships except one. We are very happy.” Scott showed another Shanghai EA daughter, Jemma Kalliste, to Silver Champion Senior Mare for example. Jemma Kalliste is out of Shamilah Jina Bea, herself out of two World Champion: Warandes Plakat and the unforgettable Julia Bea. The organizing team offered a riding class, too. It was an attempt and it worked out quite well with several competitors. Who knows, many things grew from its small beginnings and became a success story. Heartfelt thanks goes out to the hardworking show organising team for hosting this beautiful event. Absolutely a show to put on the calendar for next year!